The number one goal for so many companies is to increase conversions. You spend so much time, money, and effort getting people to your site, capturing their emails, and offering them high-quality content, products, and services. But how do you get them to convert to customers? What’s the key? As it turns out, the key is B2B content marketing. How do we know this? 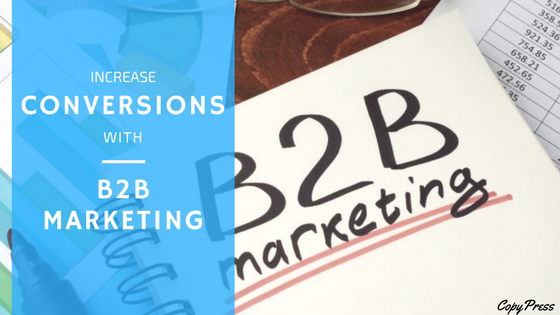 CopyPress worked long and hard on a B2B content marketing process over the past year. We figured out what worked and what didn’t, and we ended up increasing our lead flow by over 300 percent. That’s a pretty staggering number. We created a five-step program to accomplish this goal. Before anything else, creating quality content is key. We generate 12 blog posts on key topics in the niche. The topics for these posts are relevant and timely. Each post is 1,000 words long and includes fully illustrated headers. Writers who know the industry write the posts; they are experts in the field. They have gone through testing to prove they are qualified. In fact, we’ve created quality content with our trained and vetted writers for companies like Facebook, Macy’s, MTV, Hipmunk, and Airbnb. If we don’t have writers qualified in a certain niche already in our large Community, we find them, test them, and train them. On top of that, the process includes editing and additional QA to ensure all style guide specifications are met and the writing is of a high quality. Multiple eyes on each piece means mistakes don’t slip through. Because the writers, editors, QA team, and project managers work together, everyone is on the same page, the process is smooth, and there is a lot of room for any potential questions or concerns to come up before we get close to the deadline. Once these posts are approved and published, they generate traffic and links. This is the goal of step one. Once the posts are done, we choose one and create a whitepaper based on it. The whitepaper features custom illustrations. It organizes data and information into an interesting and highly shareable format. The whitepaper is written by, you guessed it, a trained writer. If your whitepaper isn’t relevant and/or relies on old or questionable information, it could hurt your reputation. This is why we have expert researchers to get accurate, up-to-date information for each and every whitepaper we generate. The combination of high-quality writing, accurate and timely information, beautiful design, and a highly shareable format is what helps the whitepaper generate leads. Throughout this process, you are assigned a marketing strategist, a project manager, and a QA team. They know what to look for and how to provide you with the best content and experience possible. You’ll get to know your team, which makes the process even easier. The next step is taking the whitepaper content and using it to generate an infographic and a Slideshare deck. Infographics are an important part of a marketing campaign. After all, 90 percent of the information our brains process is visual. As for the Slideshare deck, not only can we use it in LinkedIn advertising and onsite, but it is a great way to plan and execute monthly webinars. Webinars have many important benefits, including connection with clients and creatives, funneling traffic, and strengthening the brand. Plus, they’re just plain fun. You can show the world the people behind the company and reinforce your brand persona, both important aspects of connecting to your audience. A connected audience is a consuming audience. After the infographic and Slideshare deck are created, we design a popover and 250 x 250 ads that will lead blog or website traffic to the whitepaper landing page. After the content is ready and the popover has been implemented onsite, the design phase is over and we are ready to get the party started. With the visitors from that popover getting sent to the whitepaper landing page, we’re maximizing lead generation from the traffic of the ongoing publishing of the blog posts we created back in step one. We get them reading, interested, and coming back for more, and then we offer up even more high-quality, in-depth information on a topic we know they already care about. Not only that, but we’re capturing their emails at the same time. These are quality leads. Once these readers have given their emails, we send a targeted mailing campaign using Mailchimp. This turns into a lead generated sale. Most of this process is automated. If you’ve never used an email marketing service like Mailchimp before, we’re here to help. Everyone has to start somewhere, so why not benefit from everything we’ve learned? Setup is easy, and services like Mailchimp even make it fun. CopyPress knows outreach. We have publishers in our Community in a wide range of niches, but we also reach out to more publishers in the desired vertical. The publishers promote the whitepaper and supporting media, which is the infographic and Slideshare deck. Outreach like this is a win-win. The publishers get more traffic for their site and get to tie-in to a great company in their space, and the company gets a huge surge in inbound, natural linking, which in turn increases traffic and leads. The company also now has a whole host of brand ambassadors who are influencers in their space. We’ve found outreach with these influencers to be massively successful, that is, as long as you know how to separate the good influencers from the bad. CopyPress followed these five steps over an eight-month period. That’s where we saw the 300 percent increase in monthly lead generation. As you can see, the B2B content marketing is a great solution. These steps may seem involved and like they have a lot of moving parts, and that’s because they are and they do. Because we’ve mastered this process and have seen it do so well, we’re offering this package to our customers. It’s 50 percent the cost of a single marketing employee. For such a massive increase in lead generation, that’s hard to beat.